For those of us who have grown up listening to the sound of Bruce Buffer’s voice, the desire to hear it employed in the service of something other than announcing the weight or hometown of a UFC fighter can sometimes be overwhelming. That voice, like James Earl Jones’ or Alec Baldwin’s, is simply too iconic to be limited or proscribed. It longs to soar. Which is why fans over the years have recruited Buffer to announce their weddings or record the outgoing voicemail messages on their iPhones: to liberate him. And to challenge him, perhaps. Which is something, after 20 happy years with the UFC, even Bruce Buffer must be looking for: to stretch that voice out and see what it’s capable of, to explore the dimensions of his gift. Sure, it’s difficult to pronounce “Jedrzejczyk” in front of 10,000 drunken cage-fighting fans, but eventually speaking even the most difficult Polish surname in front of even the largest crowds must become unconscious. And the soul left unchallenged will surely die. Which is why it was such a pleasure to go on YouTube yesterday and hear Buffer (who has spoken the phrase “Live from the Grand Garden Arena” more than any human being ever should) say, with all his trademark bravado and swooping cadence, these words: “Choose a fighter or a specific fight that you feel translates or encapsulates a social movement or movements beyond the ring or the cage! Then, choose a lens to explore a larger meaning, argument, or claim about where the subject fits into a larger context of the world!” “Encapsulates”?!! ”Social movement”?!! “Larger meaning”?!! Bruce?!! Suddenly, after two decades together, I was witnessing Buffer bellowing words and ideas that lived miles away from “the main event of the evening,” and my soul was pleased for him. 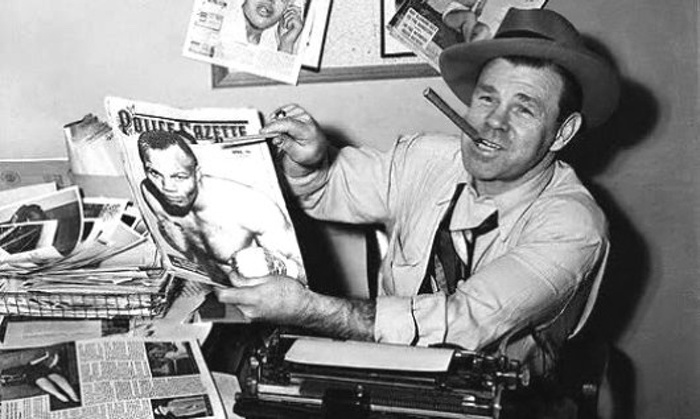 That’s right: a class at a major university about the art of writing about fighting—and even more amazing, one where writing about MMA is given the same respect writing about boxing (ancestral home of James Baldwin, Norman Mailer, Budd Schulberg, and Joyce Carol Oates, among many others) gets. And all we can say is it’s about damn time. That and: Where was this class when we were in college? The answer, of course, is absolutely nowhere. The answer is that when we were in college MMA wasn’t even MMA yet; it was just ultimate fighting, which meant it was just barbarism, and any college class about it would have been some mind-numbing slog through its sociological implications and the insight it offered into the decay of the human mind and the collapse of civilization. And who wants that? No, this class is timed perfectly (for 20-year-olds if not for us). Now a professor like Kidder can build a class syllabus around the phenomenon of women cage-fighters, the racial relevance of Tyron Woodley, and the geopolitical implications of Bruce Lee movies and not get laughed out of the academy. Suddenly training a new generation of MMA writers seems like a worthwhile pedagogical enterprise, not a postcard from some horrid dystopian future. Just think about it: This week as Bruce Buffer takes to YouTube on their behalf, Kidder’s students are writing about the physical dangers of combat sport, and next week they’ll be taking on the war between MMA and Meryl Streep. Who knew such things were being taught in our colleges and universities? And why didn’t you call us to talk, Professor Kidder? This kind of thing has been right up Fightland’s alley for as long as Fightland has been around (minus the grades and the homework and all the talk of “Class Citizenship”). We would have been happy to shed a little light for you and your students on the joys and perils of trying to understand and turn into literature the social, political, racial, sexual, and aesthetic meaning behind mixed martial arts and the difficulties of getting lovers of words to care about cage-fighting and cage-fighting fans to read. We’ve been here all along, waiting for your call!